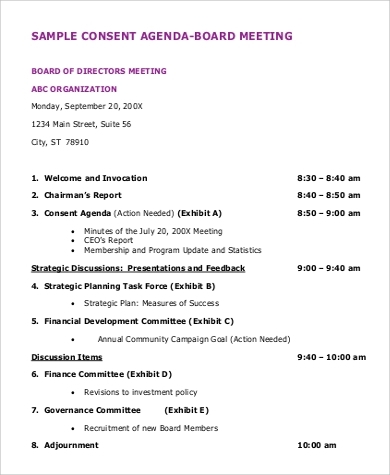 A board meeting is a time for the board of directors to do and accomplish everything that needs to be done, and having an agenda helps the board members to maximize their productivity, efficiency, and accuracy. Without an agenda, a board meeting’s productivity may dwindle down to a waste of time that could cost the company. You can check out some Agenda Samples to help you in creating your own agenda by just clicking the download button for free. It’s conveniently organized and editable for use. 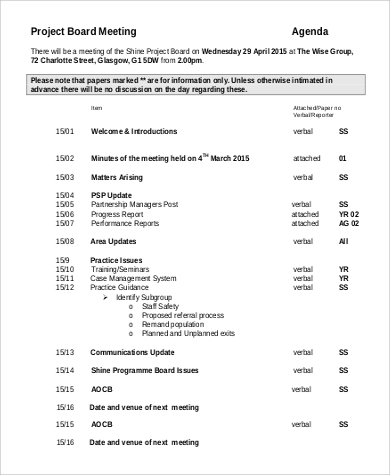 Read through this article to see more of our board meeting agenda samples that are also free for download. 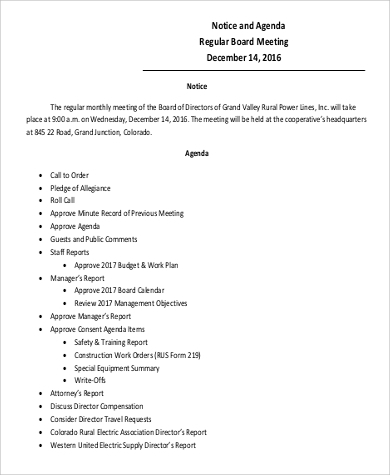 The board holds a meeting to ensure that they are able to communicate and get updated with everything that is happening in the company both in the efficiency of the employees as well as the productivity of the company itself in the marketplace and as a whole. Other business unrelated associations can benefit from having board meetings as well, just like religious communities, home communities, and even school. 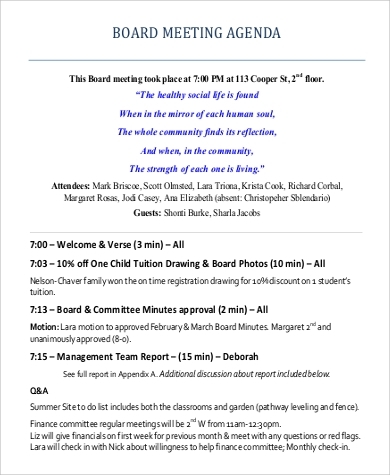 It is a special time where the board of directors does what needs to be dealt within those given time and tackle all the underlying and current issues. 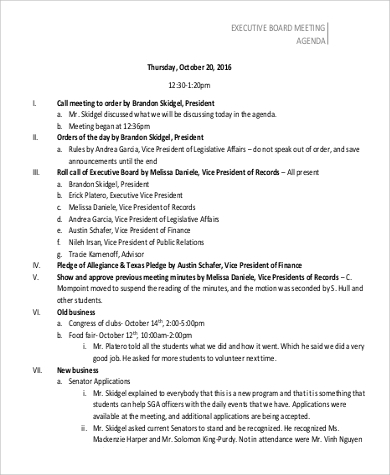 How Does Having an Agenda Play a Role in the Meeting? Better management or use of time. Having an agenda allows the participants to stay focused and on track by following the timeline set in the agenda. All discussions are substantial. 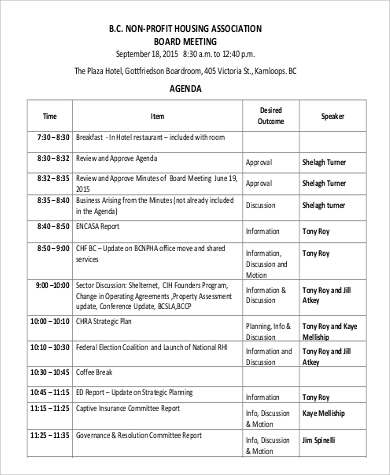 Receiving the agenda ahead of time allows the participant to prepare and provide an adequate researched and supporting documents, data, and other materials for the highlighted topics. Stick to point discussions. It ensures the members to stick on the current or underlying issues that needs their attention. Old business and irrelevant questions are not allotted in the agenda. Urgent issues are dealt in a timely manner. 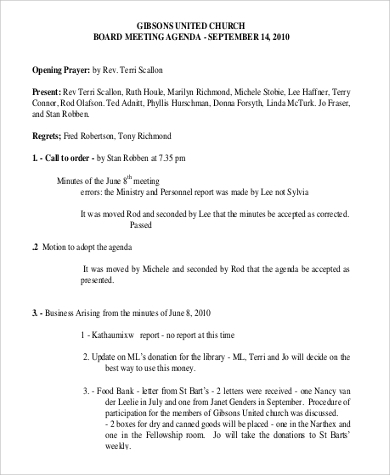 Following through the timeline provided in the agenda, having the urgent topics to be discussed at the top list, allows the members to have a direction of the meeting making it productive. The meeting meets a conclusion and decision. Without time being wasted and everything following the direction provided by the agenda, the end of the meeting will always reach a decision and conclusion that is more substantial than any meeting without agenda. Agenda is needed not just for board of director’s meeting, it can also be used for daily activities to help manage your time wisely, which you can read all about in our Daily Agenda Samples article. 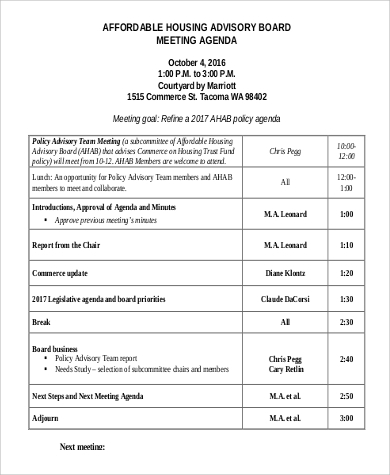 If you want to read and see more about meeting agendas, check out our Meeting Agenda Samples article. Both are free to download and editable for use. Big and small business companies, schools, religious sectors, home community, and even the government relies on board members’ decision to run smoothly. The importance of having an agenda before setting up a meeting becomes essential to make sure that time is used productively and the decisions made during the process more valuable. We want our company, organization, or community to run smoothly and effectively whilst dealing with any underlying issues. 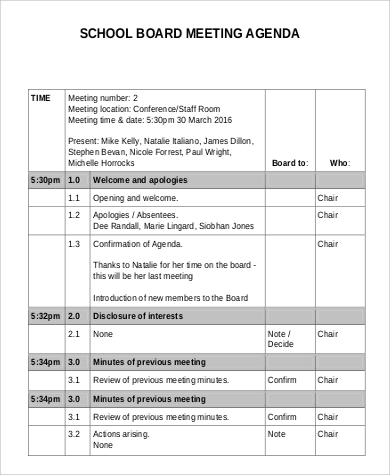 Our board meeting agenda article provides samples that are free to download and editable for you to use, available in PDF format. 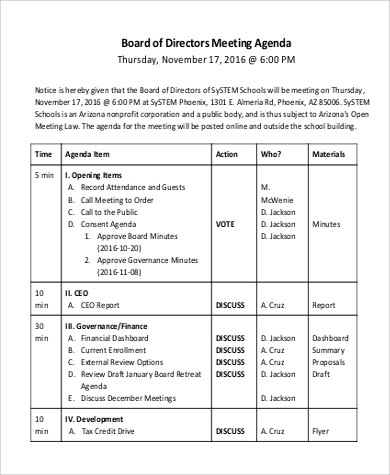 See also our Weekly Agenda Samples.